As of May 25th 2018 the General Data Protection Regulation (GDPR) is in effect. The GDPR is a privacy law that applies throughout the European Union. Thanks to this law, the protection of personal data is regulated in the same way in all the countries of the EU. The personal data you give us is stored with the utmost care in accordance with the GDPR. Our website uses a SSL-connection. This way you are assured that you can safely place orders in our web shop. We use data that you leave with us for different purposes. On this page you can read which goals they are. Toyism Art Movement only uses the data you have entered and does not collect data for which you have not been explicitly requested to do so. When you place an order with us, we collect your name, address, telephone number, email address and payment details. We do this to process your order as well as possible. This way we can deliver your order and keep you informed of the status of your order. We also provide your information to others if necessary for an order, for example to delivery services or distribution centers. You can also create an account on our website. This can be done in the shop or in the blog. The details you enter here are your name/email address and a password. This information is stored by us so that you do not have to enter it again. When returning a purchased product we use delivery services. They use your data to handle your return. You can sign up for our newsletter. Through this letter you will stay informed about offers, new products, new projects and news about Toyism Art Movement. If you no longer wish to receive a newsletter from us, you can unsubscribe at the bottom of the newsletter. You can also find a blog on our website. You can post comments and/or upload pictures here. You decide which details you want to enter here. This data is stored by us and displayed in the comments of the blog page. Toyism Art Movement sometimes hosts competitions. Therefore we also collect your data, such as name, address, email address and telephone number. We need this information for the competition, to determine a winner, inform participants of the course of the contest and to inform the winner of the competition. When the competition has ended, the information you have entered will be destroyed. If the government obliges us to do so, Toyism Art Movement is obligated to give customer data to the government. If you buy products by telephone or email that you do not want to pay immediately, we can call you or contact you in writing to remind you of an invoice that is overdue. We may also pass your information to a collection agency or a bailiff who collects unpaid invoices on our behalf. We also store contact details from our business partners and customers. We treat this personal data just like those of our regular customers. Toyism.com does not use Google Analytics at this time. If you use our social media, for example Facebook, Twitter or Instagram, you can follow Toyism Art Movement. When you indicate that you like an article/post or comment on it, that article will appear on your social media account. 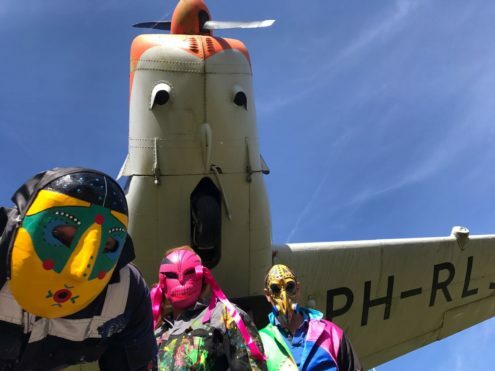 Toyism Art Movement cannot access your social media account, but articles/posts that you like, comment on or find useful, you can share it with your friends. If you ask us a question via social media, we will save that message and your account name so that we can respond to that message. The retention period used by Toyism Art Movement of the information you have provided depends on the purpose of that data.